Bend holly into a wreath. Intertwine grasses from the heath. Add a curl of thyme for the fairies. In the gloaming, carry it nigh. Spake the White Witch’s soft sigh. Notes: Inspired by the Sunday Whirl, Wordle 144. 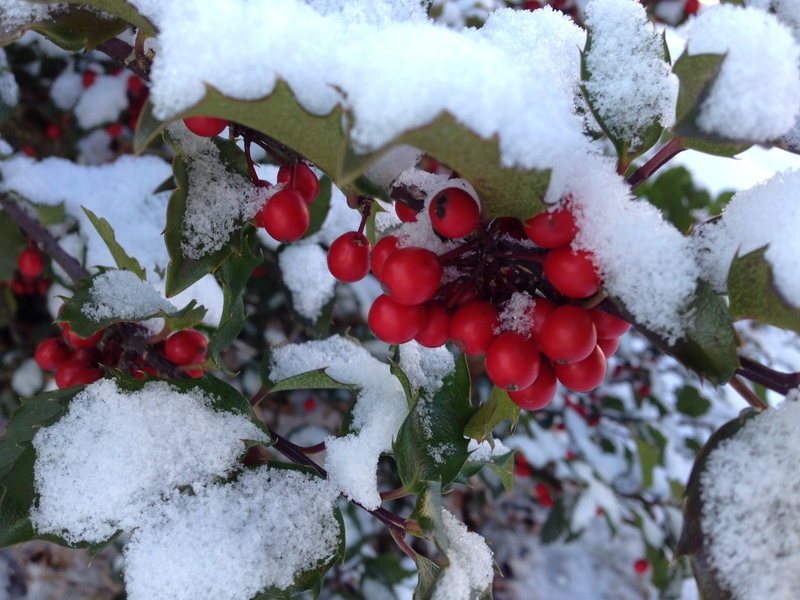 This says *winter* to me-red berries, green leaves and plenty of white snow-a lovely image Brenda! Ooh look! ILEX. Great story! I don’t know ILEX. But thanks!! Ah, you clever botanist! I never managed to take the woody class, but I did take the flowers horticulture class. One of my favorites, looking back, but overwhelming at the time. Glad you think so. I had a great time writing it, it was so much easier than a sonnet. LOL I don’t know why I enjoy torturing myself with all this rhyming, but I do. White she is this day…but alas the sun shines through the bitter cold. Nice! The witch seemed rather nice. Love the pic! My favorite so far. Love it. She sounds wonderful, Brenda. Love this!